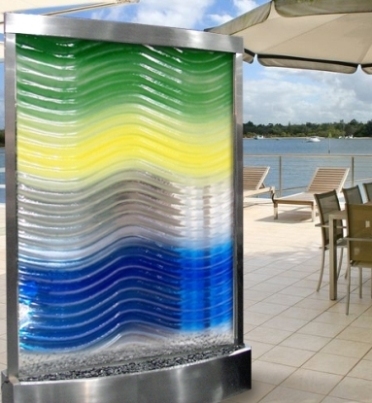 This floor fountain incorporate unique slumped rippled texture glass, which is done through the process of imparting texture and patterns into sheets of glass involving intense heat to soften the glass sufficiently for it to melt over and into specially prepared moulds. Beautiful work of art, dazzling the eye and soothing the ears with a gentle cascade of falling water. Memorable statement in any lobby or entryway. Call for details.